The majority of the newspapers which Wandsworth Heritage Service hold are on microfilm, we have a few early hard copy papers from the late 19th century and a set from the 1930s-1950s, but very little in between. 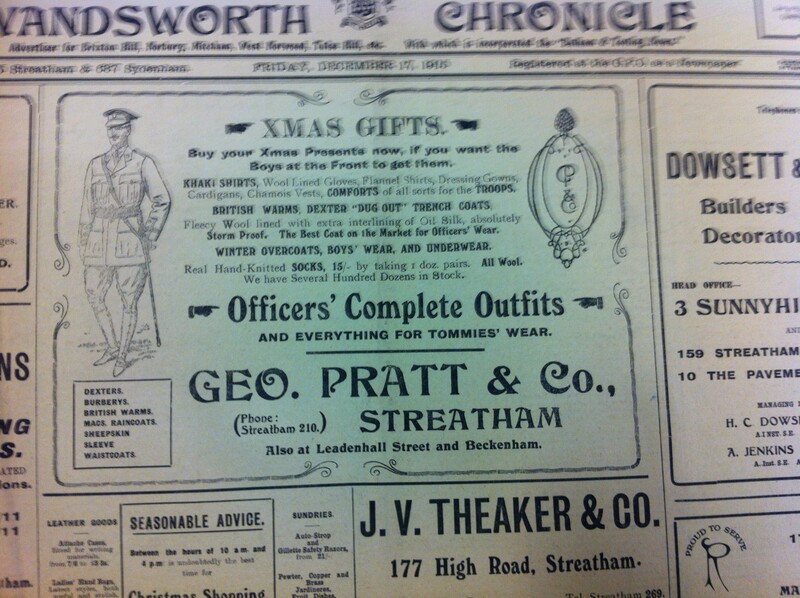 Some recent moves in our stores revealed that we have a bound copy of the “Streatham News and Wandsworth Chronicle” from 1915 – the majority of the stories in it relate to Streatham or are duplicated in other local newspapers, so its late discovery doesn’t mean too big an omission for this blog, but if has given us a chance to look at some of the adverts preparing the borough for Christmas 1915. On the front page is an advert encouraging shoppers to buy presents now if they want them to get to the Front in time for Christmas. A range of clothing was available – for Officers and for “Tommies”, although the advert does rather suggest that Officers were top priority. The absolutely storm proof “Dexter ‘Dug-Out’ Coat” with an oil silk lining sounds both appealing for the trenches and rather more expensive than many soldiers might have been able to afford. 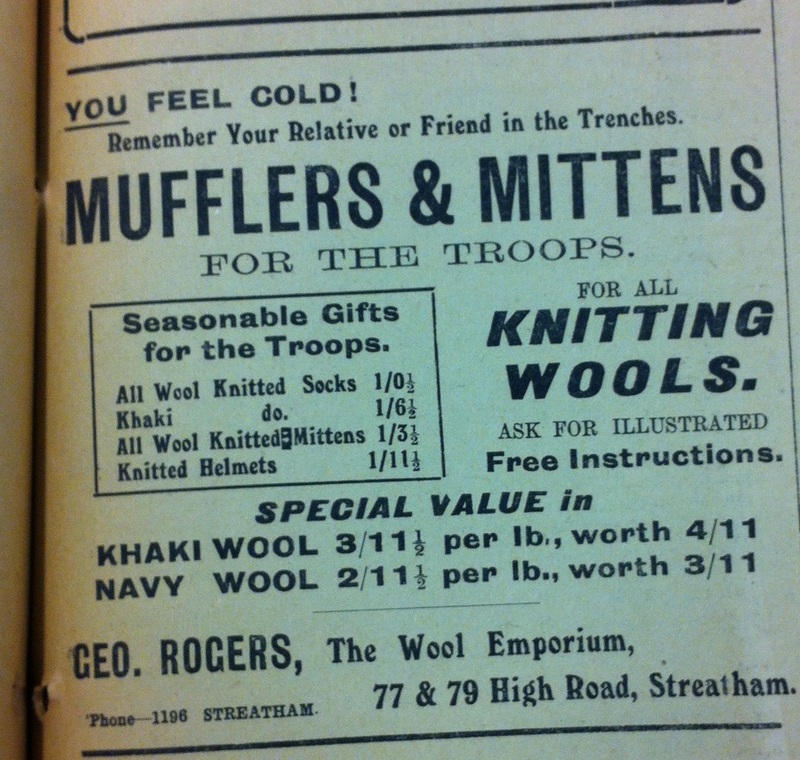 Further down the same page, an advert for George Roger’s “The Wool Emporium” encourages knitters to think about mufflers and mittens for the troop – and emphasises how troops are worse off with the phrase “You feel cold – remember your relative or friend in the trenches”. Khaki and Navy wool were both on good value offers. Pre-Christmas entertainment was available at one of the local cinemas. 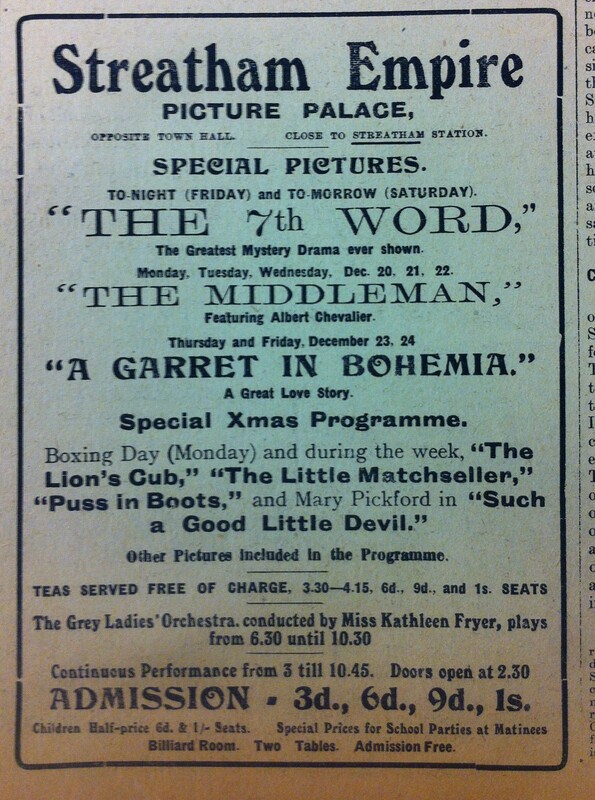 The Streatham Empire had several films showing, including advertising a Special Xmas Programme which featured The Little Matchseller and Puss in Boots amongst other. The Grey Ladies Orchestra was accompanying these between 6.30pm and 10.30pm. 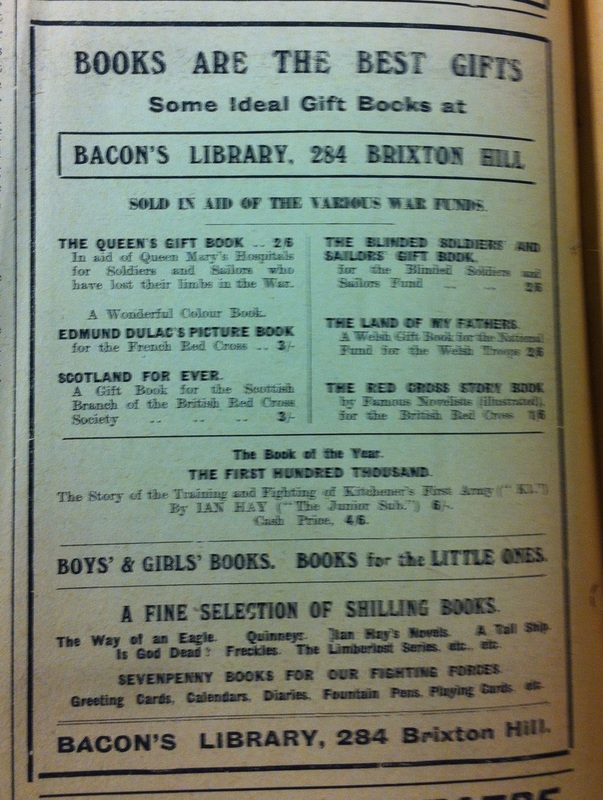 For those thinking about preparing Christmas dinner, Francis & Sons on Streatham High Road, Brixton High Road and Balham High Road were offering a range of fare. 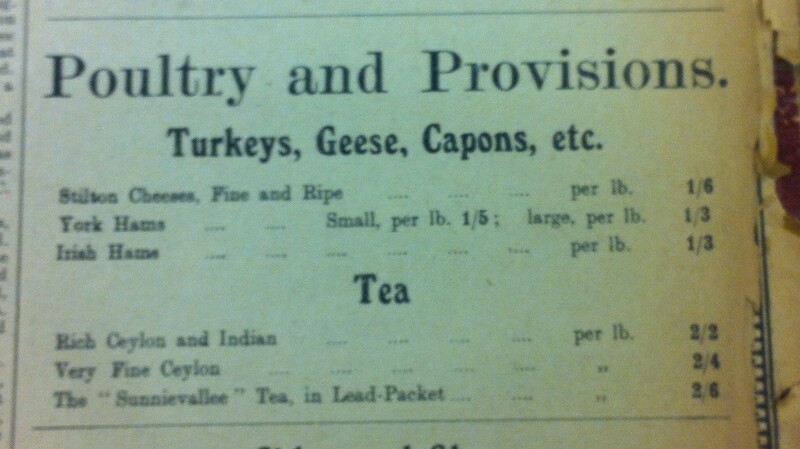 There were turkeys, geese and capons, as well as “fine and ripe” Stilton. If anyone knows why SunnieVallee tea would be in lead-packet, then please do let us know – it was selling for 3s6d, which was over a shilling more than the Fine Ceylon tea. 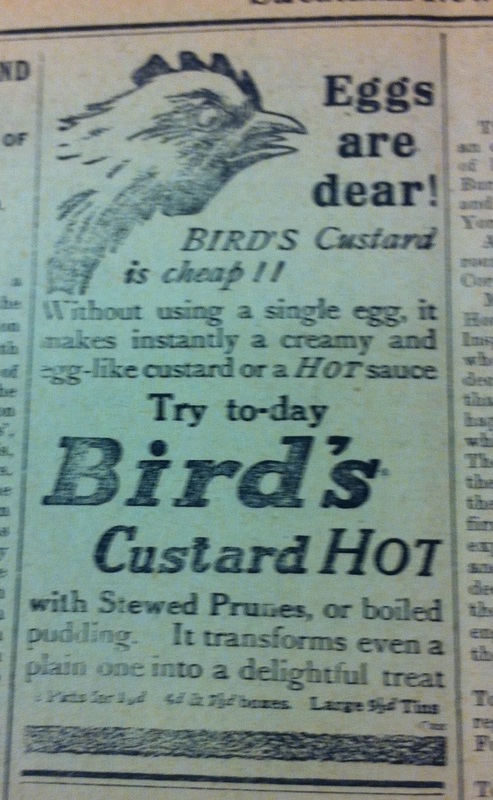 For dessert, there was an advert for Bird’s custard, transforming even a plain pudding “into a delicious treat”.